Having come into Christian Science from a different denomination where I just accepted certain things such as Jesus is the God of the universe and matter as the end-all do-all substance of everything, I assume the purpose of the Six Tenets is a feeble attempt to communicate (commune maybe) with other Christians. Like you wrote, sometimes it works, sometimes it doesn’t. The big no-no to not accept is that Jesus is God. I have seen some pretty strange religions on Christian television. Some of them are way more wacko in how that act and teach than Christian Science. Yet, because these odd groups see Jesus as God, they are accepted within the Christian tent. They even have gotten on Christian television. 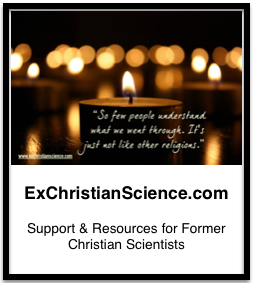 In the early 1990s, Christian Science had a few television programs that were carried on a open-minded religious network. When the network was bought by another Christian group, the first thing they did was cancel the Christian Science and Mormon programs. Again, some of the shows now on Christian television are far-out. At least the Christian Science programs were carefully laid-out intellectually in comparison. But who wants intellect when you can have belief? I have a theory too long to explain here, why Mary Baker Eddy has Six Tenets instead of Seven Tenets. There really should be Seven Tenets. Why do I say that? Mrs. Eddy writes very often in fours and sevens. Fours and sevens are part of her writing plan or style. It’s a type of writer’s symbolism she employs. Many Christian Scientists ignore the style, probably out of an unconscious fear of a very distant and unnecessary association with numerology. So they miss out on the obvious use of fours and sevens in her book IMHO. Bill, I would love to hear your theory about having seven tenents! I have been to several speeches about the artwork and symbolism in “Christ and Christmas.” What you sent is new to me. I will have to share it with some of my metaphysically oriented friends. On first glance, it seems to take a lot faith to believe the complicated geometry involved. I am aware of the theory of complexity as civilization progresses, but I’d rather have a few things explained in a simple fashion. It’s like humor. If a joke is too long, it hinders the punch line. I agree, MJSmith is quite verbose. However, I have not found many others with her unique perspective. She does not update very often, but when she does, I find it fascinating. From some speculative corners of quantum thinkers, there is this theory that we unconsciously construct our belief systems in a projected way. Perhaps some of this projection is what is going on. Some adding on more and more complex symbolism may be sidetracking what we really should be doing sometimes, when the symbolism becomes “the thing” over personal growth or applying spiritual laws to help others. Paul talks about “speaking in tongues” as sometimes having a confusing side to it. Perhaps this Christian Science symbolism you sent, taken over the borderline just too far, is speaking in tongues. Some people understand it, but most people are left hanging. Christian Science is confusing enough. That is one reason for the attempt to better communicate with an up-to-date textbook. The idea appeals to me. See the “Christian Science Journal” reaction to an update in the July issue, page 42. It’s worth discussing. Do you happen to have a link or full-text available? I’m unable to find the article in question — we no longer subscribe to any CS-lit, and anything online is behind a hefty firewall — the exception is the very early stuff that Google Books has thoughtfully provided.